Kersusomen or 'Kerusso' is a transliteration of the Greek word 'Proclaim' used more than 60 times in the New Testament Bible. Our name states our purpose to Proclaim the Gospel of Jesus. 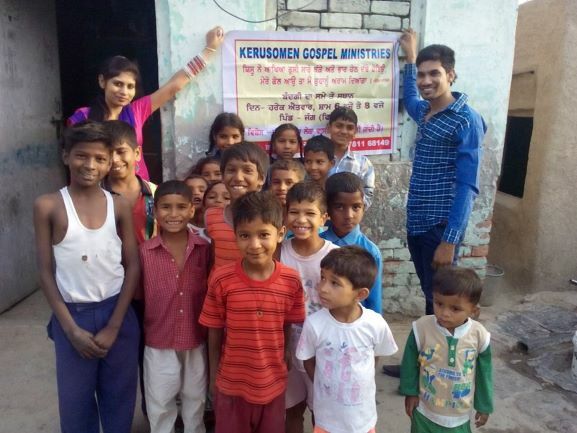 Kerusomen Gospel Ministries is a 501c3 non-profit Christian organization that identifies Christian Missionary work both in the United States and overseas and provides assistance to these believers as they work to fulfill the Great Commission. We look for pockets of underserved believer populations, missionaries, and Christian organizations where a little help goes a long way. Right here in the United States, there are over 14 million widows.That is an average of 40 widows for every church in the United States (AARP). Friends Needing Friends International, an interdenominational sisterhood of widows, serves that population and fits our criteria perfectly. First, God commanded us "to look after orphans and widows in their distress and to keep oneself unstained by the world.” (James 1:27) And second, Friends Needing Friends stewards its gifts faithfully; 100% of all donations are committed to the mission as all overhead is supported by dedicated volunteers. "Upon the death of a spouse, a widow loses 75% of her support base. It is imperative for churches to stand in the gap. But in North American churches, I see hardly any intentional church wide ministries to widows. Millions are left to suffer and struggle in silence." That’s a huge need left virtually untouched. When Kerusomen identified this grassroots organization who is stepping up and filling that emotional and spiritual gap, we were proud to partner with Friends Needing Friends. And because of that relationship, God has led and enabled us to help fill that gap in India, as well. To connect faithful, like-minded, Believers (like you!) with opportunities to serve the local and international Church, in need, so Believers can grow in their faith by reaching the lost with the good news of Jesus Christ and bringing the love of Christ to others through compassionate care. Church Planting. Partnering with indigenous Christian Ministers, in their countries of origin, by assisting them to make disciples while serving the helpless, poor, and needy in their communities. Compassionate Care. Partnering with Christian Organizations, locally and abroad, that are serving the Lord faithfully by helping poor and desperate people meet their basic physical needs of food, water, clothing and medical care. Organizations that are stewarding the gifts entrusted to them diligently, so that together, we can have the greatest impact in meeting needs of the hurting (such as orphans and widows) to the glory of God. Prayer. We desire and are grateful for your prayer above all other giving. Thank you. Treasure. You may designate the program God leads you to support on the notes section of your Paypal donation. Undesignated funds are directed, prayerfully, to the God-led area of most need. 100% of your gifts go directly to the mission field; all program administrative costs are absorbed by volunteer Board Members. That the Holy Spirit will guide, bless, and touch your heart as you read through this site. Your involvement is greatly needed. Whether it is a donation of your finances, your time, your network... and, of course, your prayer, Kerusomen Gospel Ministries depends on people like you to make a difference. Please contact us to tell us how you feel you would like to help change lives.